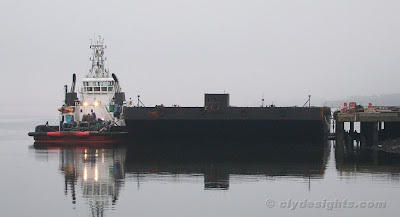 Another tug making a brief visit to the Clyde was KESTREL, seen here at Port Glasgow having delivered the flat-top barge MICLYN 3319 which will be converted into a cable-laying barge at the Ferguson shipyard. KESTREL was built in Japan as IWAKI MARU in 2008. She was later sold to JP Knight (Caledonian), and after working in the Indian Ocean and Persian Gulf for a short time, as part of her delivery voyage to the UK – under the St Vincent & the Grenadines flag and managed by Redwise for the trip – called at Singapore to uplift the barge in September. KESTREL is 659 tons gross, has an overall length of 36.0 metres, and is driven by twin azimuthing units. The barge was built in China in 2007 for Singaporean owners, and has a deadweight of 12,000 tonnes. It is 100 metres in length, with a beam of 30.5 metres.